AMBA ATB 1.0/1.1 Verification IP provides a smart way to verify the AMBA ATB 1.0/1.1 component of a SOC or an ASIC. The SmartDV's AMBA ATB 1.0/1.1 Verification IP is fully compliant with standard AMBA ATB 1.0/1.1 Specification. Our AMBA ATB VIP is proved across multiple customers. Support AMBA ATB Master, ATB Slave, ATB Monitor and ATB Checker. Supports Flush Request Response control - Flush valid/ready signaling with trace data. Supports master internal buffer storage,configurble of trace sources to store trace locally or not. 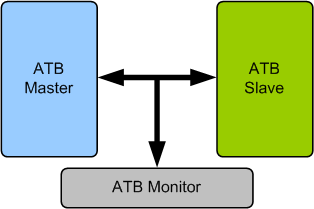 Faster testbench development and more complete verification of AMBA ATB 1.0/1.1 designs. SmartDV's AMBA ATB 1.0/1.1 Verification env contains following. Complete regression suite containing all the AMBA ATB 1.0/1.1 testcases.